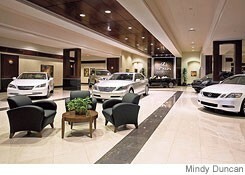 Car shopping takes on a whole new meaning as luxury car dealerships are implementing multi-million dollar makeovers. A recent Wall Street Journal article by Neal Boudette, “Luxury-Car Sellers Put on the Ritz,” caught my eye: one, because I like luxury cars, and two, because I love to be pampered. (Really now, who doesn’t?) And the reason for these makeovers? Well, “the goal is to create the look and feel of five-star hotels for customers, increase the dealerships’ car allocations and even make it less likely that rival dealerships will pop up nearby.” Large retail chains like AutoNation Inc., Wilson Automotive Group, Fletcher Jones Management Group, and Herb Chambers Companies are all jumping the gun to actualize these lavish changes in their dealerships. Who would’ve thought you could walk into a dealership to get your car serviced and get a “day at the spa” all at the same time? I love the idea as much as I hate walking into a dealership service department (which is the raison d’être, I think). 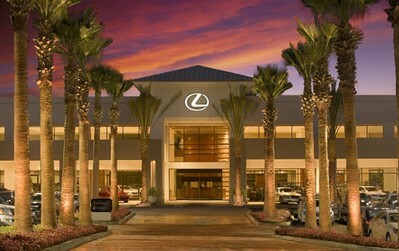 Luxury dealerships, like Lexus, are remodeling their venues with amenities like European coffee bars and cafes (think Starbucks), vibrating massage chairs, test tracks, putting greens, flat-panel TV’s, and offering free services like shoeshines, manicures, and shuttles to the airport. The interior decor has transitioned to an upscale environment, creating a luxurious “5-star” ambience to include polished stone bathroom counters, fireplaces, and skylights over the showroom floor. The reason for this increase in upscale-style dealerships is a result of several factors. First off, it reflects the growing population of the wealthy, and what they require in “raising the bar” for luxury service. And of course, as more car dealerships are stepping up in the ranks, competition increases, making those super-luxury dealerships that were once considered the few and rare, now a norm. As, Vince Liuzzi, general manager of Herb Chambers Lexus says that “you’ve got to do a lot more to wow people now.” Once upon a time Lexus was the only brand that offered loaner cars to their customers who brought their vehicles in for service. However, now this has come become expected at most dealerships, and an alternate differentiating point becomes necessary. If you do the math on the recent AutoNation’s Palm Beach Lexus store’s $35 million dollar upgrade, it’s pointed out in the article that the investment made sense (and cents) from day one. Lexus has a deal that they will allocate more cars to dealers who upgrade facilities. For the $35 million investment, the Lexus store in Palm Beach can order 2,000 more cars on top of its normal allocation over the next 18 months or so. Last year the store sold 2,710 new cars, so by quick CarsDiva math they increased their likely sell through by roughly 1/3 or an additional potential sales of another 111 a month, on top of their 225 or so monthly sales. Who knows exactly what is made per sale, but, chances are with that kind of growth in the “top line” number the upgrades were a wise financial expenditure – and they protect their exclusive market sales area in the process, in their demographic of growing population and affluence. Not a bad deal at all..
As an educated consumer though, the facts above dictate that I am really paying for these upgrades in preserved profit margins for the dealer though, right? They get a third more cars instead of a competing franchise in their territory, and I was always taught that competition fosters price competitiveness. So without it, there is naturally a lot less discounting and the preservation of the profit margin of the dealer with no competition, right? Not to mention the fact that, as the only local Lexus dealer in a large market territory, the service pricing, that is, what’s not covered under warranty, can probably include a very hefty price margin as well. That’s a basic law of supply and demand. That’s probably fair though, as a wealthy consumer (hypothetically speaking), I’m demanding this type of catering (remember I’m the one that expects the “bar raised”), so I should pay for it.